For most pathogens, vaccinations are used to reduce the spread of an infection and are supported by public policy normally. However, with pathogens such as influenza there are multiple strains, so a team including CEID member Andreas Handel sought to examine the relationship between vaccination coverage and pathogens that exhibit strain variation, and how this relationship might affect disease spread. They created mathematical models to study the effects of two competing influenza strains and vaccination protection against one strain. Contrary to what may be expected, the models found that there may be benefits to an intermediate level of vaccine coverage as opposed to maximum coverage. In their model, they examined two co-circulating but distinct influenza strains. Natural infection with one strain providing long-term immunity to the exposed strain and temporary cross-immunity of the other strain, while vaccination only provides immunity to the strain included in the vaccination. In part due to cross-immunity, the model found that optimal coverage occurred when between 10% to 50% of the population was vaccinated as opposed to maximum coverage. The models took multiple scenarios into consideration, such as age groups in relation to recovery time and also superinfection, the possibility that someone could be infected with multiple strains of influenza at one period of time. There have been previous studies that show that an intermediate level of vaccination will provide a lower attack rate (the number of influenza cases), but also a staggering in the time of vaccination delivery against the dominant strain will also provide a similar effect. 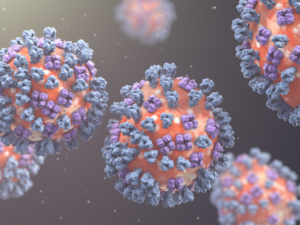 While the model used for this study had limitations, this work can be applied to other viruses that exhibit strain variation. To better inform public health policy, a more systematic model involving detailed factors, such as viruses with more than 2 strains, is needed. Future models should be applied to epidemiological data to provide more accurate vaccine recommendations to minimize attack rates.